Some of the best Art Nouveau (Jugendstil) architecture in Vienna is found in unlikely places. Like railway stations. Forget about drab, functional, concrete monstrosities. Step forward Otto Wagner and his twin “Pavillon” station entrances at Karlsplatz. And as an added bonus, there’s an exhibition inside one of them. As 19th-century Vienna anticipated growing ever bigger and more important, the authorities decided it was high time to build a modern metropolitan railway to allow mass transit and link up the rail routes into the city. Things didn’t work out quite to plan (cough, WWI, cough, end of the empire, cough). Still, the late 1890s saw the opening of various “Stadtbahn” rail lines. Otto Wagner designed the new stations, bridges, railings, etc., and many of these Jugendstil buildings and structures remain in use today in all their renovated glory. The two station pavilions at Karlsplatz no longer lead onto the platform but are perhaps the most striking examples of his railway architecture. The east one is a cafe, but the west one is a fully-refurbished exhibition hall run by the Wien Museum. The outsides feature the distinctive apple green and white colours typical across the Stadtbahn. 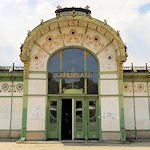 However, the Karlsplatz pavilions stand out from their colleagues because of the golden sunflower motif and decorated entrance arch. The renovated west pavilion really is a work of art, particularly when the full sun brings out the shine in the gold. Inside, the colour scheme continues, and you might recognise the checkered floor tiling from other stations across the city. The displays guide you through various aspects of Wagner’s work and life. So you’ll see, for example, photos and drawings of the Stadtbahn stations at the time of their opening, designs and photos of his other great works (some since destroyed), a model of his famous Steinhof Kirche, a biographical timeline, and portraits. Great as his achievements were, you get the feeling he might have been a tad frustrated, based on the gap between his vision and what was actually done. Or maybe that’s just the fate of any architect and planner. It seems he craved (deserved?) more than just the one Imperial commission (for the Hofpavillon at Hietzing), though, despite various proposals and designs that combined artistic merit, his renowned wish for functionality, and clear statements of imperial greatness. The building is not open all year round, but only from March 15 to October 31st, 10 am to 6 pm, closing on Mondays. Adult tickets cost €5 with concessions. As always, check the website for the latest opening times, prices and other details. The shop has posters, postcards and books covering Viennese art around 1900, including the likes of Wagner (surprise), Loos, Hoffman, Klimt and Jugendstil in general. There’s also some fine glassware, jewellery and crockery on sale from “Wiener Werkstätte” artists and designers. Karlsplatz is not far from another of Otto Wagner’s more famous designs, the Majolika House (see the map below) and the Jugendstil Secession building that houses Klimt’s Beethoven Frieze. If you can’t see the pavilion from where you’re dropped, simply go into the subway station and look for the Resselpark exit. Follow the path curving up and to the left. Alternatively, there’s a direct exit from the U4 subway platform. Go up the stairs at the east end, and then take the stairs on the left that lead back in the other direction. You pop out behind the pavilion.